Is cinema culture really taking off here in Nigeria? We’ll get to this later. 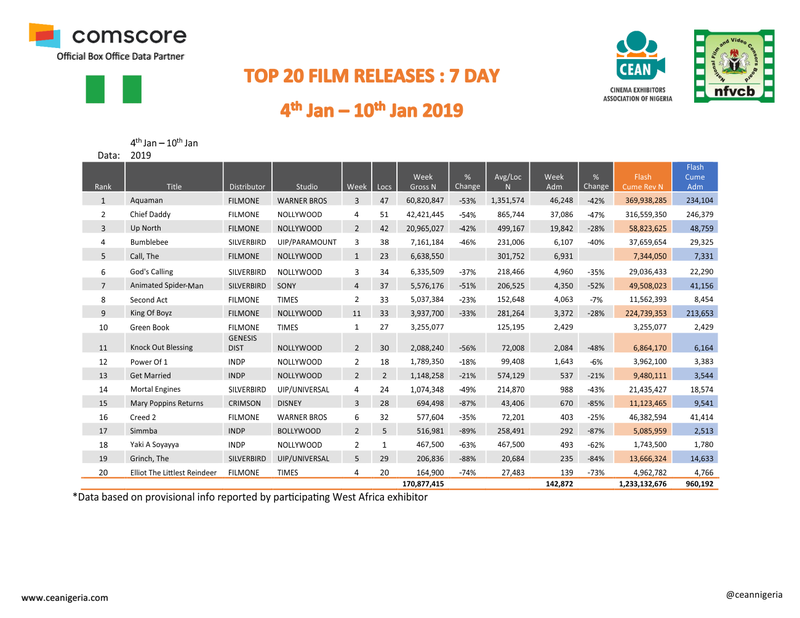 But according to statistics from the Cinema Exhibitors Association of Nigeria (CEAN), Nigerians spent over N443 million at cinemas in January 2019. The statistics also show that Nigerians have cut back on the number of foreign movies they watch. In January, much of the cinema revenue went to Nollywood movies. For instance five of the ten highest grossing movies in January were Nollywood movies. Movies like Up North, Chief Daddy, The Call, God’s Calling and King of Boyz collectively grossed N80.299 million in the first week of January. They account for around 45% of the N170 million spent at the cinema that week. 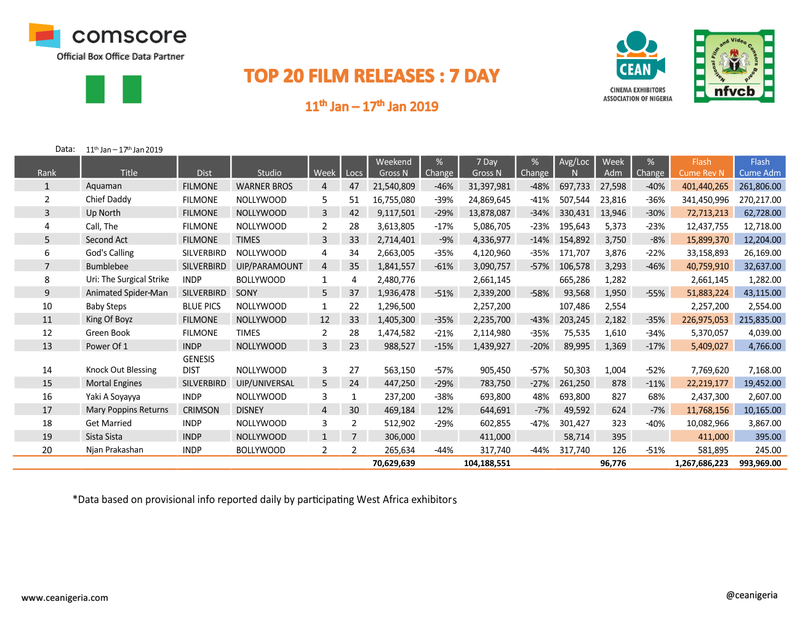 Interestingly too, at least 10 Nollywood movies made the top 20 highest grossing movies each week in January. These are positive numbers because they appear to suggest that cinema culture in Nigeria is witnessing an uptick. But on the other hand, the statistic is less inspiring when you take out data for the festive periods. First off, the January cinema statistics figures are significantly lower than the total amounts recorded in December 2018. Records from last year show that Nigerians spent over N680 million at film houses in December alone. Thus the January figures represent a 34.9% drop in cinema revenue from December. In January too, the biggest movie earnings came around the first week of the year. Between January 4 and 10, Nigerians spent N170 million at the cinemas. But by the second week that figure had dropped to N104 million. 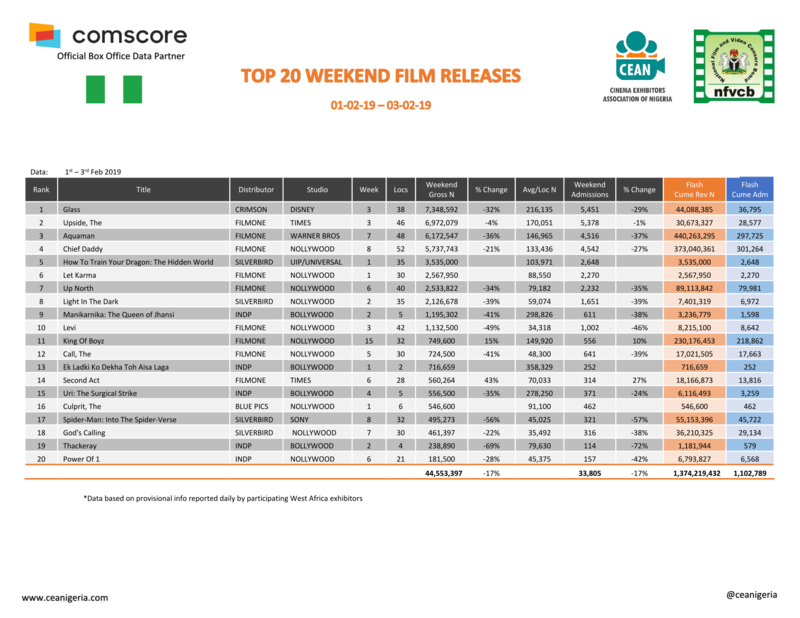 By the third week it dropped to N91.4 million. And by the fourth week, total movie grossing was down to N77 million. Meanwhile early cinema statistics for February also show that the dip will continue. Records from the first weekend in February show that N44.5 was spent at the movies. That is N8 million short of the previous weekend. And looking at historical figures, the full seven days grosses for the first week in February could probably be around N60-70 million. These are not very positive figures. But then again, January was a very busy month in a country with a static economy. With the festive season over, people had to get back to work and focus on other issues. This explains why the figures peaked in the first week and dropped each week after. Plus, this is election year and most people tend to stay indoors to avoid issues that come with political rallies on weekends. This might explain why February figures are remarkably poorer than January so far. This Valentine’s season might see a little spike but asides that, expect the figures to go lower until late March when the election season is over. 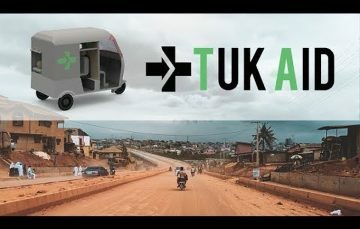 As Tricycle Ambulance Startup, Tukaid is Set to Launch in Nigeria, Just how Ready does it Need to Be?